Stephen Sollitto created this minimalistic, yet adventuristic look for the epic Tracee Lee Ross at last night’s SAG Awards. 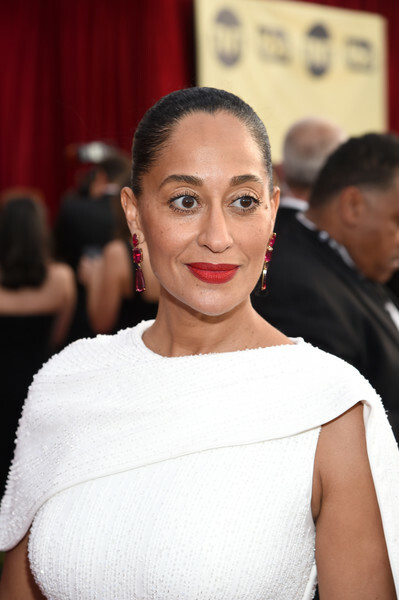 Here’s how he centered this look around Tracee’s red lip. After moisturizing Tracee’s skin, Stephen applied Marc Jacobs Beauty Re(marc)able Full Cover Foundation Concentrate in Honey Deep 58 with a wet sponge. Under the eyes, he used Marc Jacobs Beauty Remedy Concealer Pen in 7 Past Curfew. He applied a few sweeps of loose powder with a big brush to the t-zone and eye lids. Next, Stephen brushed Marc Jacobs Beauty O!Mega Bronzer Perfect Tan in Tantric 102 at the temples, under the cheekbones and chin, and at the tip of the nose to give the face dimension. He added a touch of Marc Jacobs Beauty Air Blush Soft Glow Duo in 506 Flesh & Fantasy, an ivory shimmer/goddess bronze duo, right past the apples of her cheeks to give a warm, sunkissed look. Using his finger, he tapped Marc Jacobs Beauty Dew Drops Coconut Gel Highlighter on Tracee’s cheekbones to create added depth and highlight. Stephen created a very simple yet effective eye look on Tracee. He swept the shimmering “The Most” shadow from Marc Jacobs Beauty Eye-Conic Multi-Finish Eyeshadow Palette in Glambition on just the center of the upper lids with a very loose brush to add reflection and polish. Next, he applied a heavy coat of Marc Jacobs Beauty Velvet Noir Major Volume Mascara on the upper lashes and a light coat on the bottom lashes. For the lips, Stephen applied a bold, cherry-red lip with Marc Jacobs Beauty Le Marc Lip Crème Lipstick in Dashing 206. The final look was not old Hollywood, but a modern-day star with a dashing red lip in a stunning white couture gown.